In this post, I list the different kinds of jobs you might want to consider doing here, and how much they could potentially pay. I’ve also given some tips on where to find work, and I briefly mention tax and contracts. Funnily enough, this post is really popular! I first wrote it just after I had had to send a small package to the US, and I couldn’t work out where to find a post office! Eventually, I discovered that the national mail service (4-72) has little offices (or desks) at various locations throughout the city and I thought it might help to write about the posting process. Then I discovered that people needed help with how to write Colombian addresses – the format looks pretty weird, so I also explain how these work! There are lots of horror stories going around about the taxis here, and I have had a number of less-than-relaxing taxi rides myself! The truth is that, generally, it’s ok to travel by taxi, but I recommend bearing these tips in mind to minimise your chances of running into problems. And it’s always safer to order a taxi using a cellphone app or asking a hotel to call one for you. You might also find this post about using Uber useful. Tips on where to buy clothes and shoes in the city, including some of the popular chain stores, shopping malls, markets and outlets. Here I talk about some of the popular neighbourhoods, the advantages and the disadvantages of each one (as I see them). 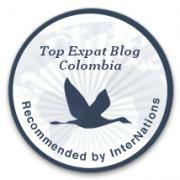 I also talk about the estratos, which will affect how much you pay for your bills each month – a vital consideration when looking for a place to live in Bogotá! One of the great things about living in Bogotá is that you only have to drive a couple of hours outside the city to visit some amazing places. Guatavita is about an hour and half’s drive (give or take) from Bogotá once you’ve left the city. It’s a lovely reserve and the lagoon is famous for its association with the El Dorado legend. I really enjoyed our day-trip there and I highly recommend stopping in the pretty little town of Guatavita (about 30-40 minutes’ drive from the lagoon) on the way back. People often assume that I live in a hot country… which would be true in many parts of Colombia, but not in Bogotá, which although near the equator sits at an altitude of 2,600m! This posts talks a bit about the weather here and gives a few suggestions as to what to wear here. This post gives a few tips on how to find somewhere to live, based on whether you’re planning a short, medium or long-term stay. These are by no means the finest restaurants in Bogotá, but they are places that I personally love and are within my budget! For many people arriving in Colombia, particularly those who are still learning Spanish, teaching English is an obvious option. In this post, I’ve gone through some of the different options, including some places that I’ve worked at or applied to myself when I first arrived. Are there any topics you’d like me to cover on How to Bogotá that I haven’t written about yet? Leave a comment below I will get to it! Hello….I would like to see a post about health care in Bogota. More specifically, I would like to get your take on the public health insurance system vs. private insurance (quality of each, cost of each, requirements necessary in order to be able to buy into each, preexisting conditions issues with each, etc.). Access to medical care is a huge issue for anyone looking to make a move to a different country. Thanks for the comment Bradley! Healthcare is on my list of topics to write about, but I’ll need to do a bit of research about it first! I have EPS (public) health insurance with Compensar, which has been good up to now. I’ll need to check out what the costs and benefits of private health insurance are. I’ll get on it and post when I have all the info!